Baintha Brakk or The Ogre is a steep, craggy mountain, 7,285 metres (23,901 ft) high, in the Panmah Muztagh, a subrange of the Karakoram mountain range. 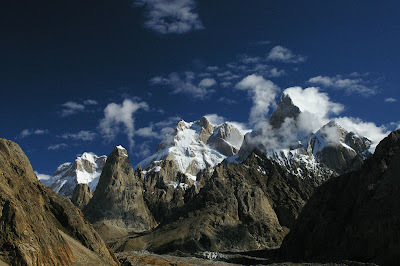 It is located in Gilgit-Baltistan, Pakistan. 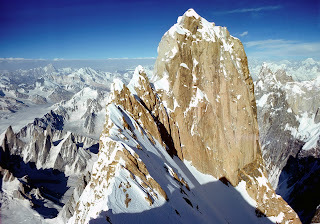 It is famous for being one of the hardest peaks in the world to climb: twenty-four years elapsed between the first ascent in 1977 and the second in 2001. Baintha Brakk rises above the north side of the Biafo Glacier, one of the major glaciers of the central Karakoram. It lies about 75 kilometres (47 mi) north of Skardu, the major town of the region, and about 30 kilometres (19 mi) north of the roadhead at Askole. Baintha Brakk is exceptional in its combination of altitude, height above local terrain, and steepness. It is a complex granite tower, steeper and rockier than most other Karakoram peaks. (The Latok peaks next to Baintha Brakk are similar, however.) For example, its South Face rises over 3,000 metres (9,800 ft) above the Uzun Brakk Glacier in only 2 kilometres (1 mi) of horizontal distance. It is because of this steep, rocky nature that Baintha Brakk has been both so difficult to climb and so attractive a target for extremely high-level mountaineers. Following two unsuccessful attempts in 1971 and 1976, the peak was first climbed by two Britons, Doug Scott and Chris Bonington, in 1977. (The other members of the party were Mo Anthoine, Clive Rowland, Nick Estcourt, and Tut Braithwaite. Estcourt, Anthoine, and Rowland all reached the lower West Summit, while Braithwaite was injured early on by rockfall.) They climbed via the Southwest Spur to the West Ridge, and over the West Summit to the Main Summit. 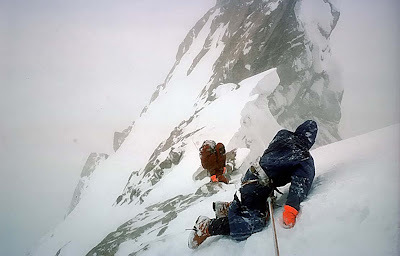 The ascent of the summit block required difficult rock climbing that extended the boundaries of what had been done at over 7,000 metres (23,000 ft). The descent was an epic: On the first rappel from the summit, Scott broke both legs. Later, Bonington broke two ribs and contracted pneumonia. Also, much of the week-long descent to base camp was in a major storm. However, they were all able to reach base camp, where they had a long wait for assistance. The second ascent of Baintha Brakk was made by Urs Stöcker, Iwan Wolf, and Thomas Huber, on 21 July 2001, via the South Pillar route, following their first ascent of the subsidiary peak Ogre III (circa 6,800 metres (22,300 ft)). They note that there were more than 20 unsuccessful expeditions in the interim. Mountain INFO magazine characterized their ascent as "arguably the most notable mountaineering achievement during the entire 2001 season."